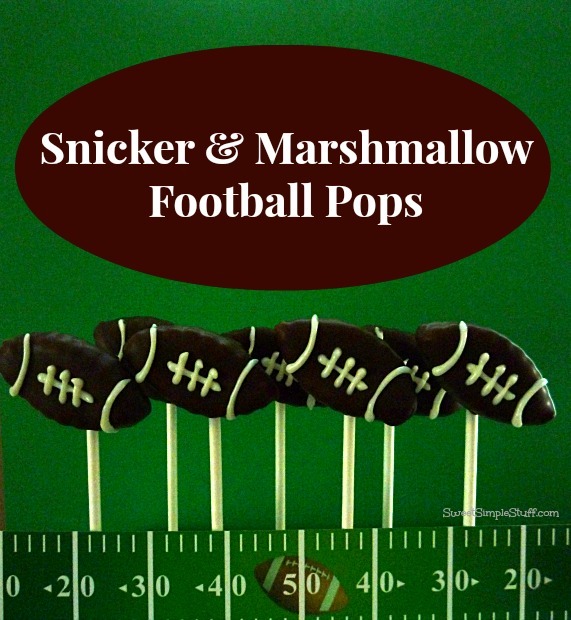 Today I’m sharing one last easy peasy football treat! There are several reasons to make these pops … Snickers and marshmallows dipped in chocolate … they’re easy to make … can be made today … stored in an air tight container at room temperature … served on Sunday! Melt candy coating according to package directions. Use a stick to predrill (about half way) into the side of a Snickers (don’t worry if it cracks, it will be covered in chocolate later). Dip the tip of the stick in melted candy and insert into Snickers, let chocolate harden. 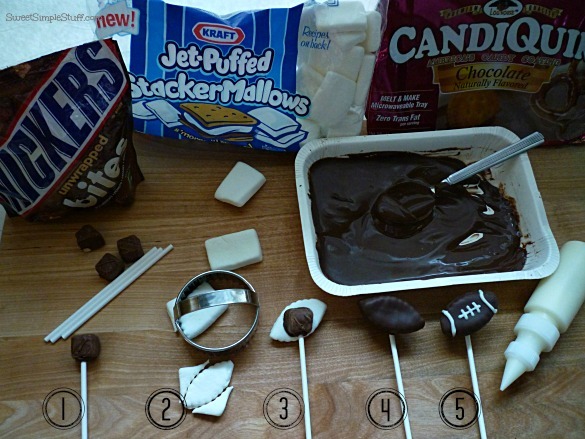 Use a little melted chocolate to attach the flat side of the Snickers to the back of the football shaped Stackermallow, let chocolate harden. Spoon melted chocolate over the entire pop, tap off excess chocolate. Place pop in a stand/styrofoam or lay (Snicker side down) on wax paper covered tray. Chill for a few minutes. Place melted white candy in squeeze bottle or pastry bag and draw lines/laces on the football. About the name … if Snickers added marshmallows to their candy … believe they would be called Snickmallows … don’t you agree? On Sunday, are you watching the game, commercials or ??? I ♥ your comments! I have never seen the Kraft Stackermallows before. I’m going to have to go on a scavenger hunt for them. Cute idea! Thank you Kendra 😉 I have bought the Stackermallows at my local grocery store, Walmart and Target … hope that helps! yes, they are tough to find, those stackers. definitely commercials. I live in NJ and I don’t even know who’s playing — and I don’t really care. I don’t think we’ll be watching the game at all. I usually watch the commercials on the internet the day after the game:) I’m sure your family will enjoy their game day snacks. These are so fun. Thank you Beth 🙂 I’ll catch bits of the game, but watch the commercials! The guys will watch the game. 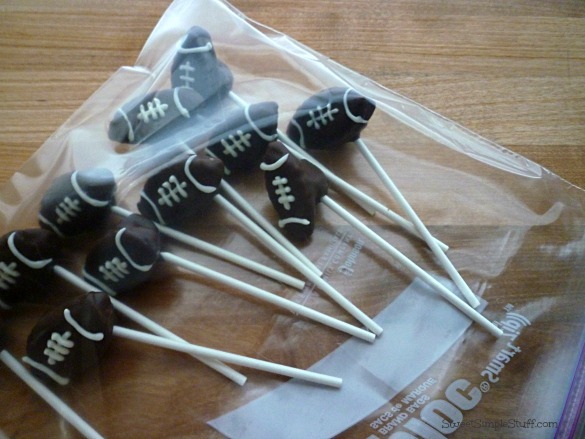 What wonderful looking super bowl treats. 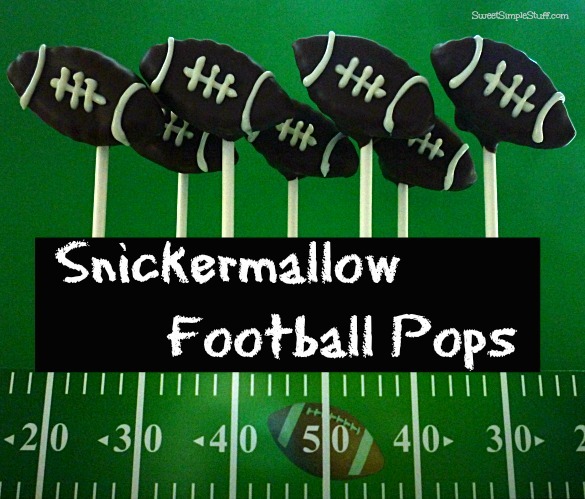 These football pops would be cool stuck in Styrofoam base decorated like a football field. 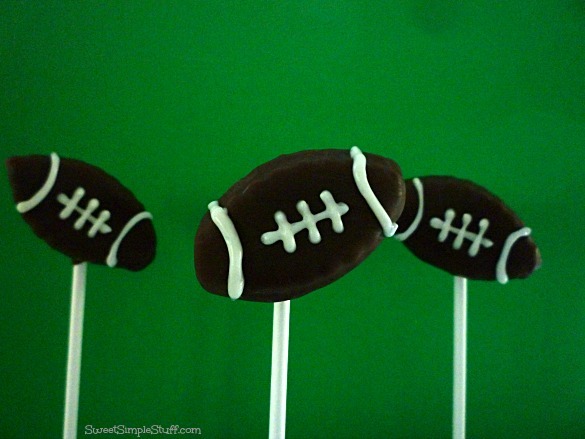 :} I will also be making some football shaped krispie treats; along with many other goodies to eat. Bring on the game! Enjoy your day and have a wonderful week. Oh my gosh, Colleen, what a SUPER idea!!!!!!!! We forgive you for watching the game (kidding!!!)! Hi Melissa, Colleen is always full of great ideas 😉 She’s a creative one! These look so good! I will definitely be making these as well as your football snack mix. I love everything Marshmallow! In Fact my roommate calls me the connoisseur of marshmallows. Our house is never without them! I will be watching the game. Probably from the edge of me seat! These are super sweet little footballs!! Perfect for the game!! Or pretty much anytime I need choc covered marshmallow goodness! !